Jess and Rob met in 2014 at a St Patrick’s Day pub-crawl. They quickly knew that it was more than “the Luck of the Irish” that brought them together! The couple wanted a rustic garden theme for their wedding day. They had a large bridal party. 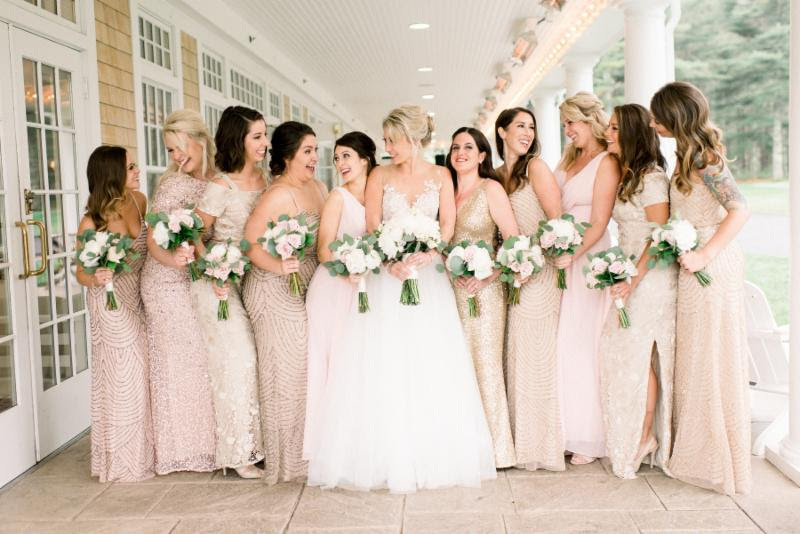 Bridesmaid’s dresses were mixed and matched in pinks and champagne colors. The groomsmen wore black tuxes. They incorporated light pink and ivory peonies and roses with eucalyptus leaves for the bouquets, centerpieces and decor. The bagpiper that lead the bride and groom from the church tied in the fact that they met on St. Patrick’s Day. Jess and Robb had a “photo guest book”. Guests took pictures of themselves with a polaroid camera and put the photo in the guest book with a note. Guests enjoyed a cigar bar where a woman was hand rolling each cigar.